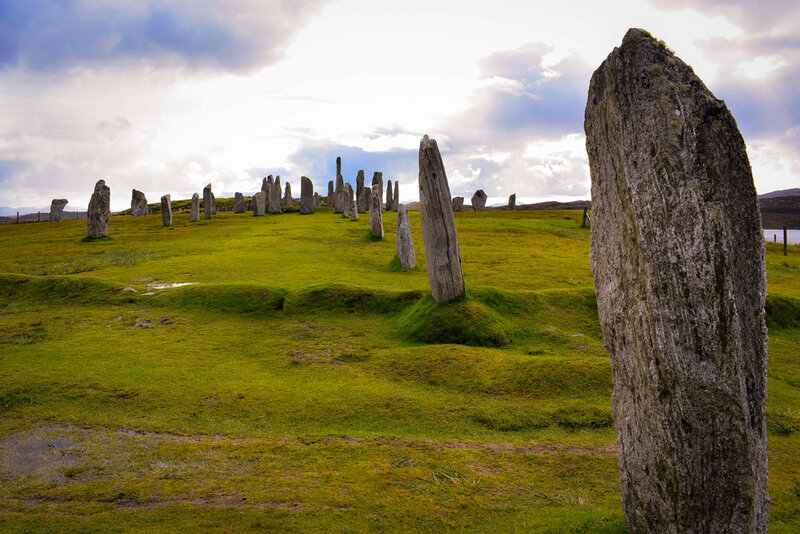 If you only ever see one set of standing stones in your lifetime, make it the Callanish Standing Stones. These stones were erected sometime between 2900 BC and 2600 BC. It's hard to even comprehend that amount of time, but standing inside a stone circle that has been there for almost 5,000 years is a very humbling experience. 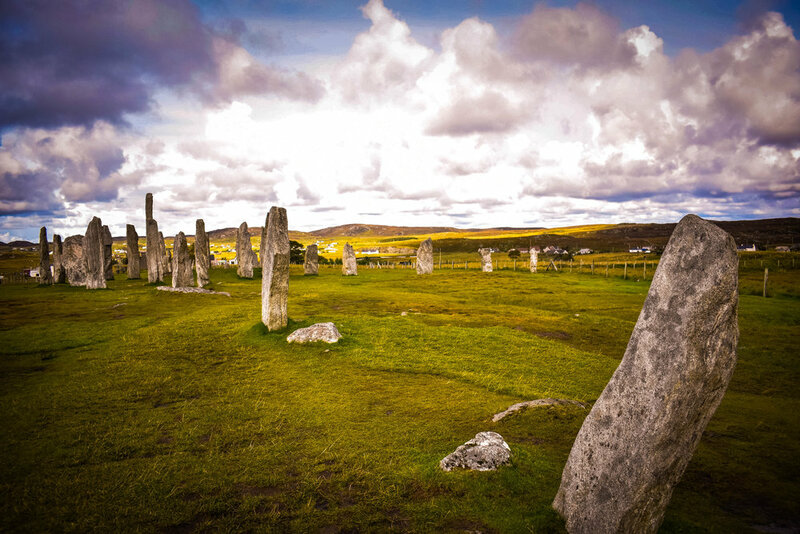 Unlike the more famous, Stonehenge where visitors must remain behind a barrier several feet away from the stones, at the Callanish Standing Stones visitors have complete access to the entire stone circle. So you can get up close to the stones, touch them, and explore the area as much as you want. One of my favorite aspects about the Callanish Standing Stones is that if you take the time to visit them, you have a pretty good chance of having them completely to yourself. When we arrived, there was another couple there that was leaving - that's it. So we found ourselves amidst 5,000 year old stones with not a single other person in sight. It was amazing. We took our time exploring and taking pictures. Then as we started to head back to the car, 2 tour buses pulled up with probably 50 people. It was such a drastic difference going from complete isolation to overly crowded in such a short time. 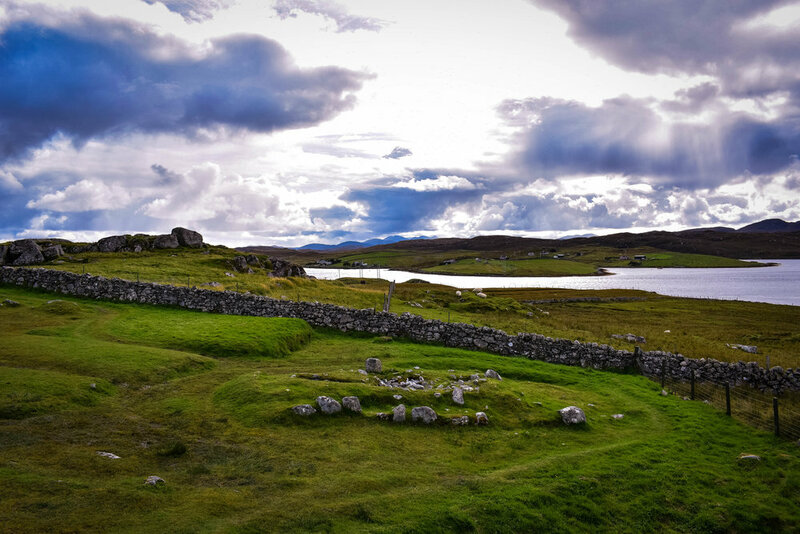 So here's a tip - if you get to Callanish and it is totally crowded, then just wait 15 or 20 minutes. The buses will leave and you'll be glad you waited them out! Another fun fact about the Callanish Standing Stones - these are the magical stones used in the first season of Outlander and in the opening credits. In the series, Claire visits a stone circle called Craigh na Dun, which unfortunately is not a real place. But, the stones are very real and they are the Callanish Standing Stones! Movie Magic made it look like these stones were up on a hill with highland mountains around it.